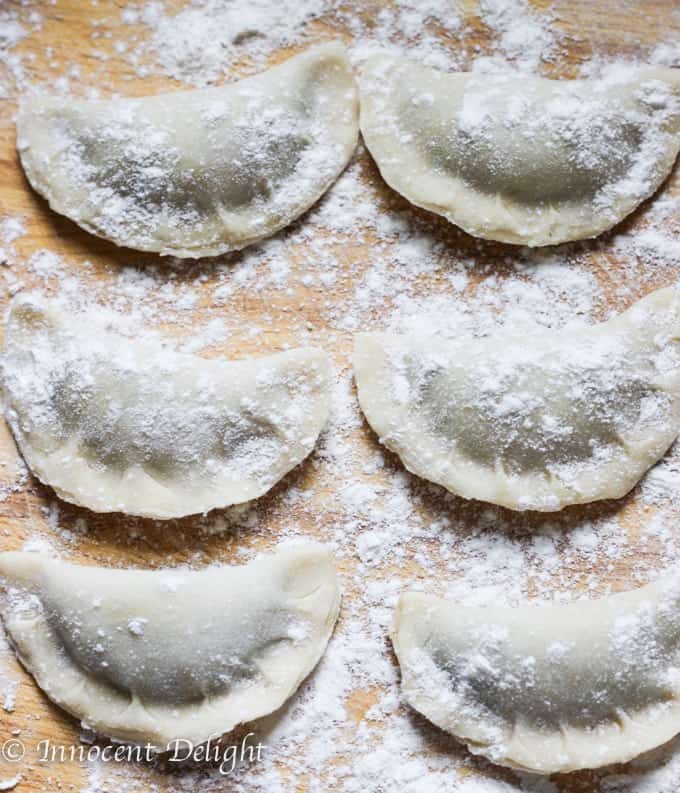 Follow this recipe to learn how pierogi from scratch should actually be made. Sauerkraut and Mushrooms Pierogi are one of those things that remind me all about Christmas as a kid. Warm and cozy Christmas Eves with presents galore and family everywhere. Although there are many variations of what people serve on Christmas Eve in Poland, I have not heard of one home that wouldn’t serve Sauerkraut and Mushrooms Pierogi. I usually make my Pierogi a few weeks before Christmas and then freeze them. This year, I only cooked for my husband and I, so I made our Pierogi on the morning of Christmas Eve. Notably, I didn’t include our little man in the head count, as he is at the stage of eating only what he likes (e.g., he could have pizza every day). I wrote in this post about traditional foods for Christmas in Poland and how to make a perfect pierogi. 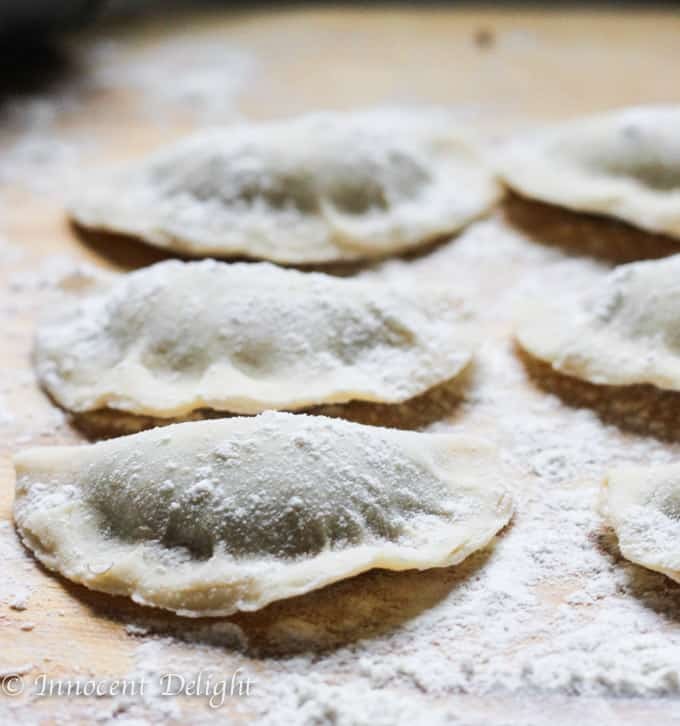 This time I want to introduce you to Sauerkraut and Mushrooms Pierogi from Scratch. 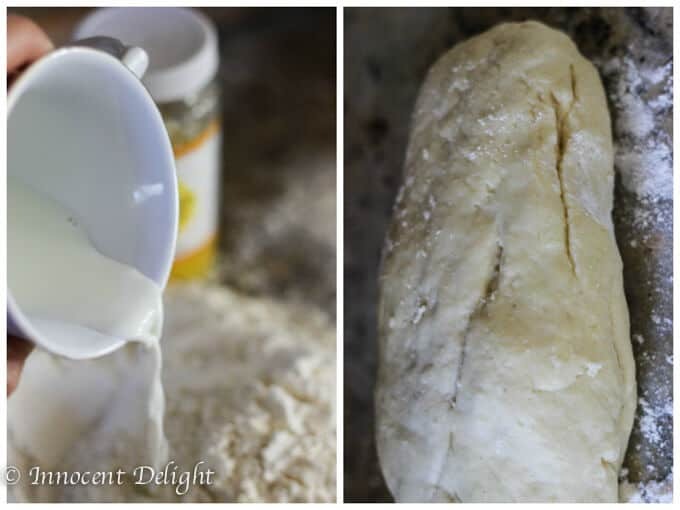 The dough is pretty simple – you just need flour, milk, water and butter. Mix it together and let it rest under a bowl for about half an hour. Then you roll the dough in batches and cut out little circular pieces of the dough, using either a cookie cutter or a wide glass. The filling for Sauerkraut and Mushrooms Pierogi from Scratch requires a little bit more work. First, if using dried mushrooms, you need to soak them for few hours or overnight. Then you’ll need to boil them in the same water that they were soaking in for roughly an hour. 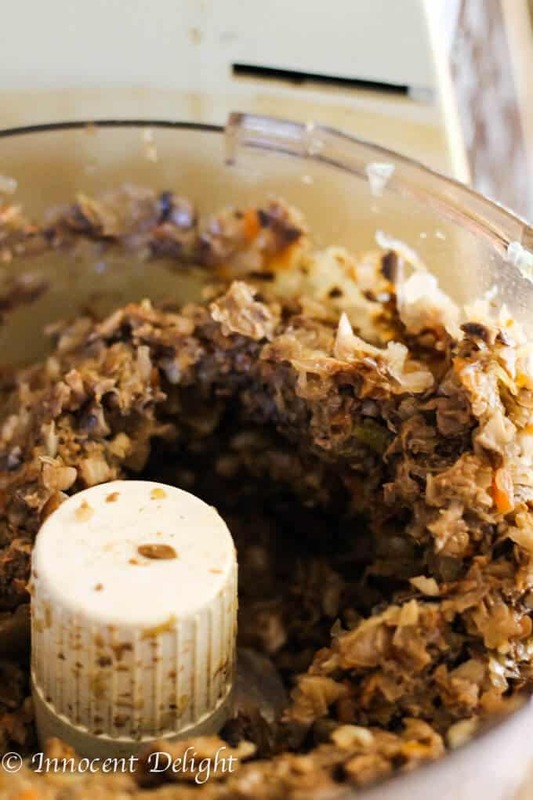 In the meantime, you should rinse your sauerkraut, then cover it in water in a pot and boil until soft. It may take an hour as well. I usually do this the day before I make pierogi. 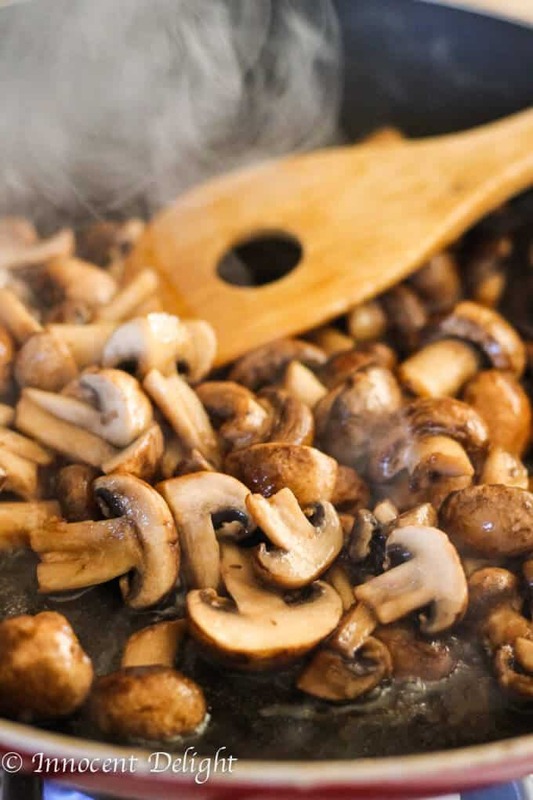 Then you’ll need to saute onions with fresh mushrooms until soft. This may take about 30 minutes. Once all your components for the filling are ready, you can use a food processor (affiliate link) to mix them together. 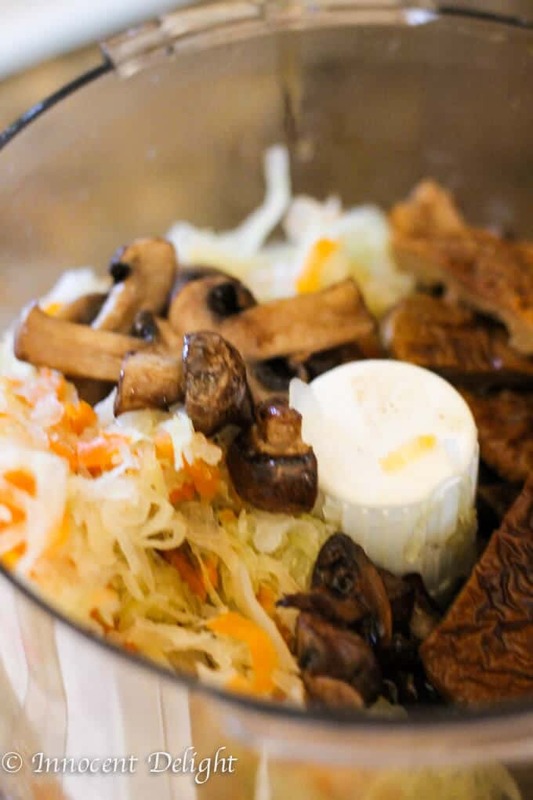 Make sure not to overdo it, so it has a recognized texture of sauerkraut and mushrooms. 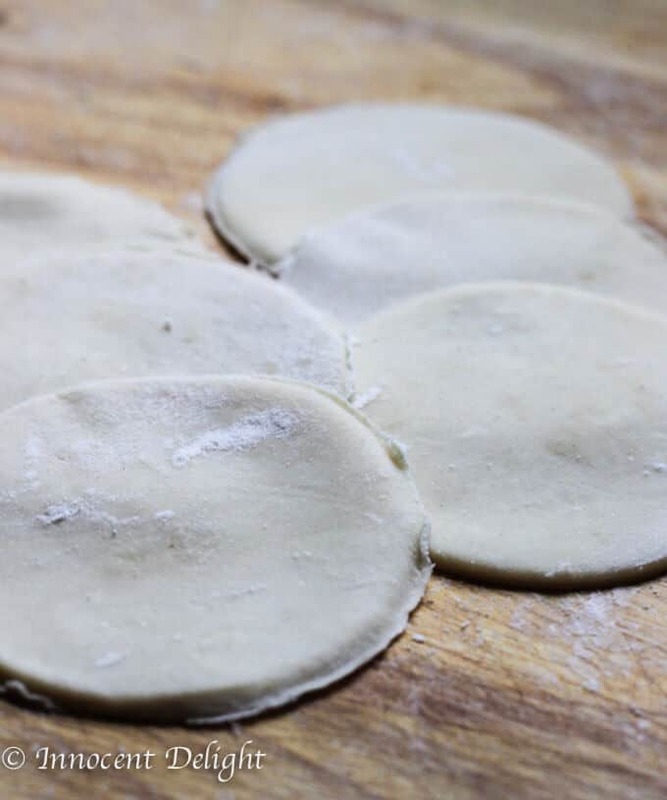 When your filling is ready, you can start to roll the dough and assemble pierogi. Have a big pot of salty water boiled so you can just drop your pierogis in batches. I usually take 1/4 of my dough, roll it until thin and then cut out circles and fill them with filling. I then seal them and boil them. Then I move to the next part of the dough. Make sure that you keep your dough covered with the plastic wrap the whole time so that it won’t dry out. 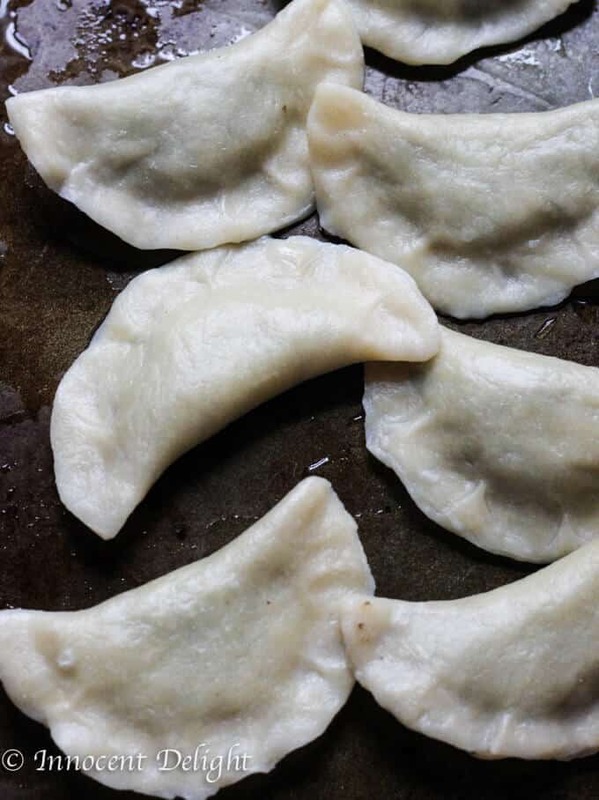 When you drop pierogi into the pot of boiling water, use wooden spoon (affiliate link) and mix them so they do not stick to the bottom of the pot. When they eventually rise to the surface, allow them to boil for another minute. Then take them out and dry them on the baking sheet. Be sure to separate them to avoid sticking. Continue until all the dough and filling are finished. 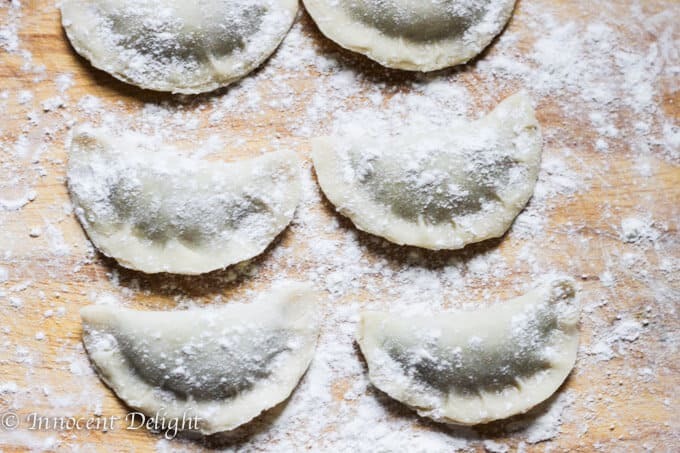 If you end up having leftover filling, you can save it and then the next day make some French Crepes and fill them with this Sauerkraut and Mushroom Pierogi filing. And you’re done. 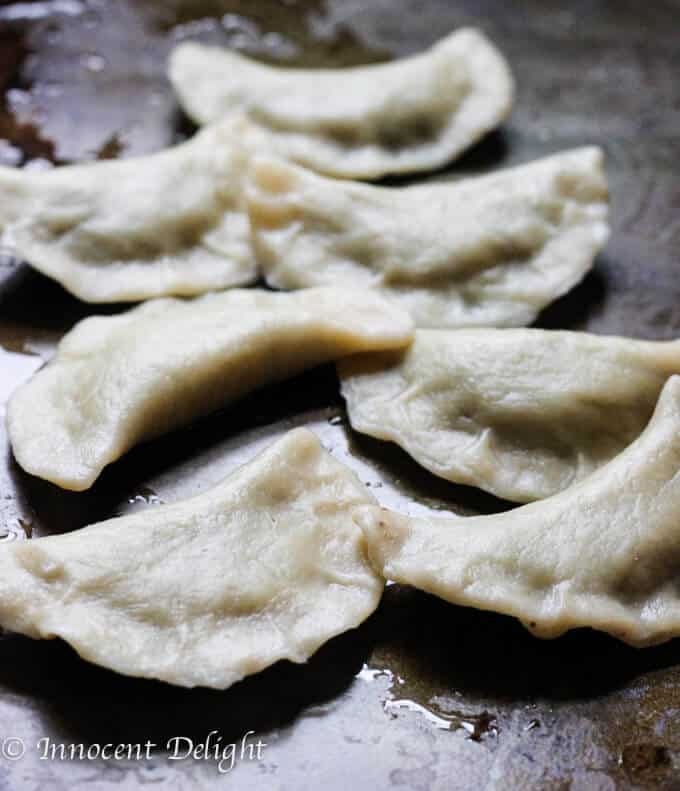 Enjoy your Sauerkraut and Mushrooms Pierogi from Scratch! 1 package of dried porcini mushrooms , 1.5 oz. 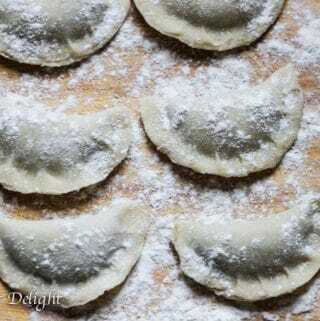 If you are not serving pierogi immediately, take them out on a counter and let them cool down and dry a little bit. Make sure that they are not touching each other. Once cooled, place them on a baking sheet, again with distance from each other, place in a freezer and let them freeze. Once done, you can pack them in the plastic bag. Check for seasoning, add salt and pepper and cook for few more minutes until all the ingredients are merged. Let it cool before starting to assemble pierogi. These sound so amazing. Totally inspired to try making them. Anything involving dough scares me (making it, not eating it) but what’s the worst that can happen right? Beautiful! 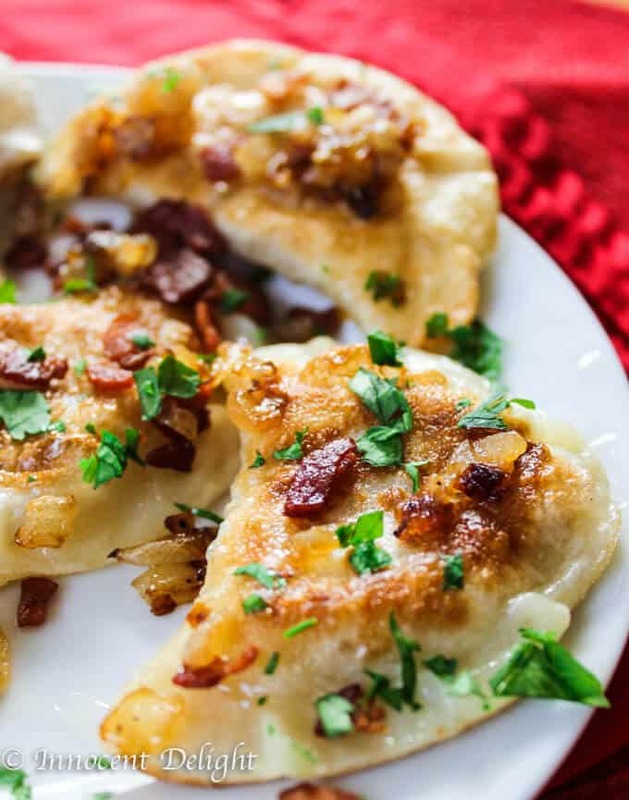 You should have about 40 pierogi from this recipe and I would say for a healthy serving – 6 or 7 per person.